The same cut off low from January 12th continued to impact Colorado until the 16th. It slowly meandered from Baja to the Arizona/Mexico Border and finally on to Texas while spinning multiple ripples of moisture into our area with increasingly less favorable atmospheric flow directions. This kept light snow showers and cloud cover over Crested Butte until the 16th. Schofield received .5” of SWE on the 13th and .4” of SWE on the 14th. CBMR reported 3” of new snow on the morning of the 14th, another 3” on the 15th, and 1” on the 16th. 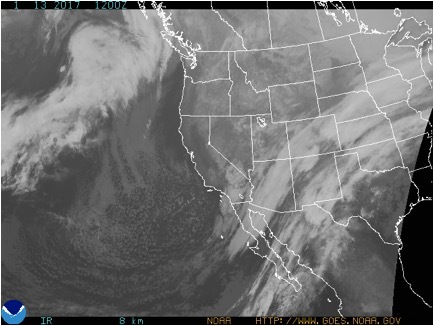 1/13/17 – Satellite image showing the cut off low near Baja sending moisture into Colorado. The weak trough slowly slid its way far enough east to allow for high pressure to build over Colorado on the 16th. The high pressure lasted through the end of the week, allowing for the first major break in storminess in over two weeks. A pleasant reminder that the sun does in fact still exist! Although the sun was out at high elevations, impressive inversions created spectacular valley fog unusual for our area. 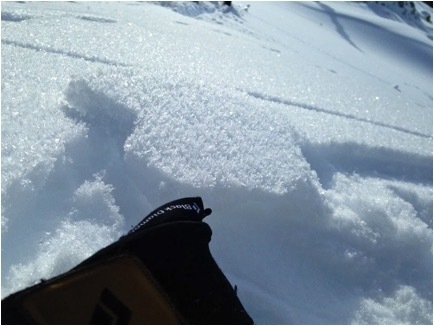 Clear, calm nights allowed for widespread surface hoar growth. At the end of the week, on the evening of the 19th, snow began to fall again, burying the surface hoar and making it our next problematic persistent weak layer. 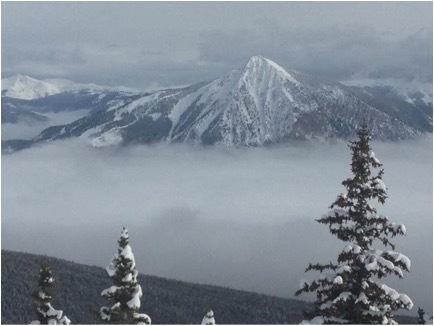 1/16/17 – Unusual valley fog below Mount Crested Butte. 1/19/17 – Surface hoar sitting on top of a soft crust on a southwest aspect. Last week’s historic storm left us with dense slabs, generally 3-5 feet thick, plastered across all aspects. These slabs are sitting on persistent weak layers at the storm interface and down near the ground. 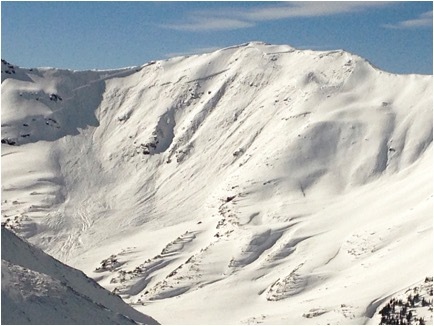 Clearing skies over the week finally gave views of avalanches that occurred during the storm cycle. 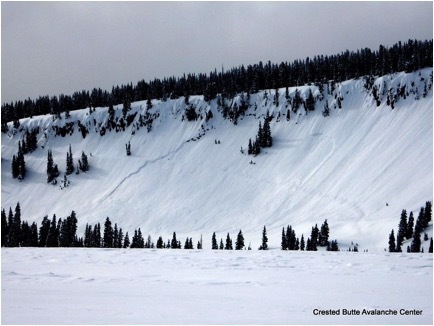 Several large, natural deep slab avalanches, up to size D4, were observed. 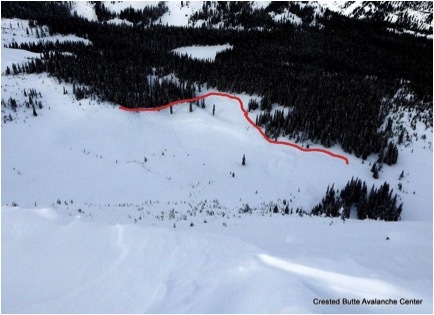 With the calm weather, avalanche instabilities slowly stabilized over the week. 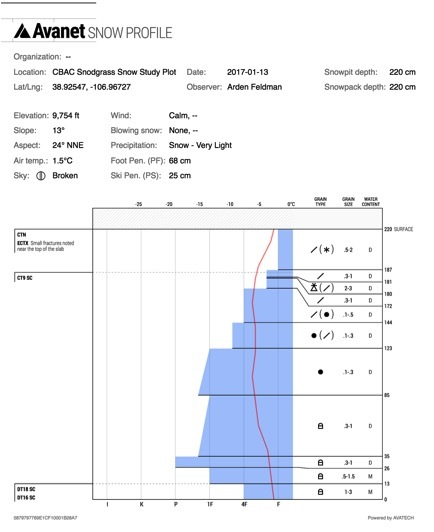 The deep persistent slab problem lurking in our snowpack was the main avalanche concern with storm slabs coming off the problem list by the 15th. The deep slab problem was slowly healing and represented a low likelihood but very high consequence event. 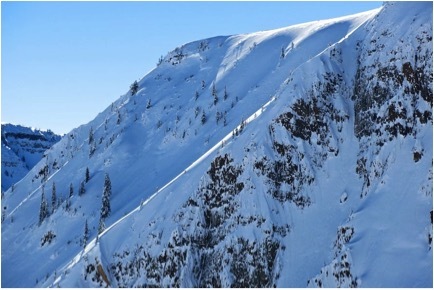 No deep slab avalanches were reported occurring in our zone over the week but one deep slab did run naturally in the neighboring Aspen zone on the 17th. 1/13/17 – CBAC Snodgrass Snow Study Plot profile showing the thick slab formed during the historic storm that is sitting upon healing weak layers. 1/16/17 – Extent of debris pile of D4 avalanche on northwest aspect of Scarp Ridge that destroyed mature timber. 1/16/17 – Partially filled in crown of D2.5 avalanche on an east aspect of Mt. Emmons. 1/17/17 – Crown of deep slab avalanche on northeast aspect of Cascade Peak. 1/17/17 – D3 deep slab avalanche that ran naturally on the 17th in the neighboring Aspen zone.